If You Are An Alabama Reader or Blogger… Or Anything Else. If you’re an Alabama reader or blogger (or not, we’d still like to communicate from you), please give us a shout. We wanna listen to your thoughts. We’d love to hear about how we can change Alabama. We’d be bedazzled to hear how we can change America in 2008 . And we’d soak up comments about how we can make The Plainsman Politico better. By all means, send us your comments. Generation Chickenhawk was a documentary by Max Blumenthal that was filmed at the 2007 College Republican National Convention in Washington, D.C. This film featured interviews with convention attendees, focusing on why they, as Iraq War supporters, had not enlisted in the armed services. Fashion Fear: Rachael Ray And Meghan McCain Are Terrorists! AP: Dunkin’ Donuts has pulled an online advertisement featuring Rachael Ray after complaints that a fringed black-and-white scarf that the celebrity chef wore in the ad offers symbolic support for Muslim extremism and terrorism. In the spot, Ray holds an iced coffee while standing in front of trees with pink blossoms. Critics, including conservative commentator Michelle Malkin, complained that the scarf wrapped around her looked like a kaffiyeh, the traditional Arab headdress. Critics who fueled online complaints about the ad in blogs say such scarves have come to symbolize Muslim extremism and terrorism. Gawker: An email tipster discovered John McCain‘s family blog has been infiltrated at the deepest level by enemies of America. Meghan McCain, daughter of the Republican presidential candidate, is really into the keffiyeh, scarf of Middle Eastern Precious Freedoms Haters, and even wears it on the so-called Straight Talk Express, and also in the presence of her apparent sympathizer mom Cindy McCain! Republicans of course will murder McCain for this horrifying development, because they are fashion whores who know the keffiyeh is so over. TIME: When President George W. Bush appeared before the Israeli Knesset recently and denounced those who appease “terrorists and radicals,” it was seen back home as a swipe against Democratic contender Barack Obama for saying that the U.S. should talk to its enemies. But his audience of Israeli legislators, who interrupted Bush’s speech at least 14 times with thunderclaps of applause, interpreted it otherwise. They saw it as the American President’s unswerving support of the Jewish nation on its 60th anniversary. 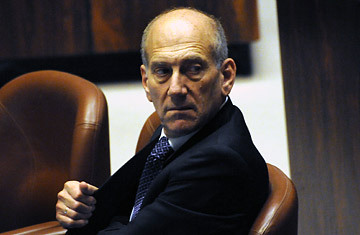 Nevertheless, under instructions from Prime Minister Ehud Olmert, Israel envoys have been carrying out discreet talks with the very “radicals and terrorists” that Bush was warning against in his speech: Syria, the Lebanese militia Hizballah and the Palestinian militant group Hamas.